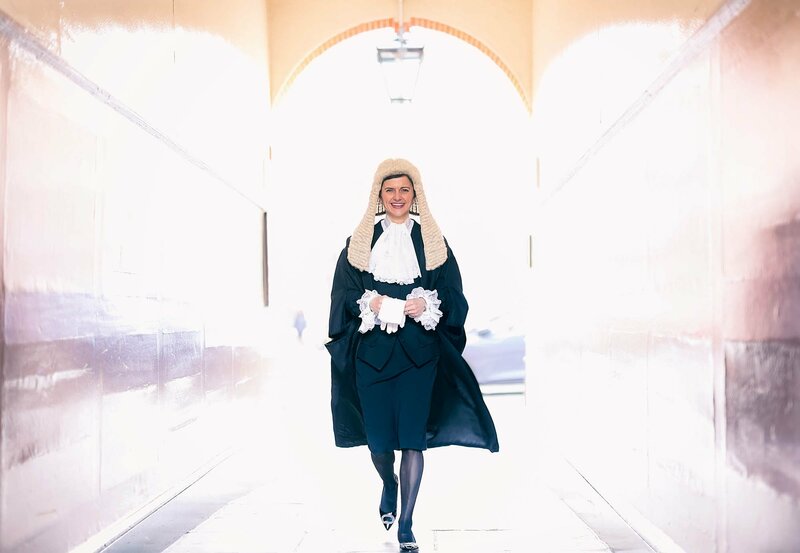 Glowing with pride, a newly-minted Queen’s Counsel bursts through a passageway in the heart of the Inner Temple, London’s maze of legal chambers and halls. One of those pictures that I knew straight away was going to be something special. One that I rush-edited on the floor a few minutes after taking it, savouring its energy and composition. At times like this, when the light falls just so, it can knock me into a bit of reflection about what this game’s really about. What we try to do, as photographers. How we execute that. And how we feel about it, and ourselves. But before we get to that, some technical chat for those who like technical chat. As you look at this shot, you might think – cor, what interesting light! And indeed it is interesting light. As you start to get a bit of an eye for taking people photos, one thing that’s quickly apparent is that the important light to think about is the light on the subject. Not so much the brightness or darkness of background or framing, but what’s falling on (usually) the face. Getting the exposure ‘right’ means doing lots of trade-offs in the settings to take account of movement, position and change in that light. My original intention was to get a nice, strong composition using the passage entrance arch to frame our eminent advocate, with just enough light spilling round her face to provide illumination in balance with that of the background and arch. Didn’t go like that, at all. The composition at that point was a bit scrappy, nothing special. There’s another button I can press that flicks the camera into a mode that helps to hold focus on a subject moving towards the lens, so I stabbed a finger on to that and held it hard. My right thumb flicked the aperture to fully open – f/1.4 – knowing that this was my last move to keep the face bright enough, and that this would flood the background daylight around the edges of the picture in a great wash of white. Oh, bear in mind you’ve been reading about the settings for around 30 seconds now. I had less than 3 to actually choose them, and much, much less than that to catch the final composition once I saw what it was imminently going to be. I’m still running backwards as well, knowing that the frame MUST include the iconic buckled shoes and, er, ‘silks’ of the traditional get-up. So I had a vague idea that the alleyways of the Temple would be good for framing something interesting. But as with so much of what I do, I couldn’t be said to have planned this in any meaningful sense of the word. And that’s what gets into my head and makes me reflect. Until a fraction of a second before it’s made, an event image doesn’t even exist. Not even as a rough concept. It just doesn’t. At some point I suddenly see where it might happen, there’s a flurry of fingers, and then BANG it’s there and has happened and it’s done and we’re straight on to looking for the next one. And that’s really wonderful and pure magic at times. And it’s also quite frightening. Because if you don’t know what’s going to happen, how can you confidently stride forwards to your client and say “I’ll make you some magic, promise”? What are such promises worth? No wonder photographers can be a twitchy bunch. No wonder we pathologically undervalue ourselves, and our work. The next second could bring triumph, or yet another miscast spell. Doing event photography feels like that…all…the…time by the way. I imagine that something similar goes on for lots of creatives, of course. It’s just that in event photography it happens at what feels close to the speed of light. It’s brilliant, and it’s also agonising. We build our dreams on wisps of light that don’t yet exist. We scry what’s around us more avidly than a clairvoyant. We read faces and feet for movements that haven’t happened yet, putting our chips down again and again and again as the roulette wheel spins before us. Sometimes, though, it all falls perfectly into place. And there’s absolutely nothing to beat it.